Dead End Drive-In and my part in its refusal to die | Daily Review: Film, stage and music reviews, interviews and more. A friend told me that Dead End Drive-In was screening at the Melbourne International Film Festival in August. This is a film made in 1986 under fairly dodgy circumstances during the infamous 10BA era that was expected to sink without a trace. Its Lazarus-like refusal to hit a dead end (sorry) has bemused me ever since. I was not only in Dead End Drive-In, I was the lead. 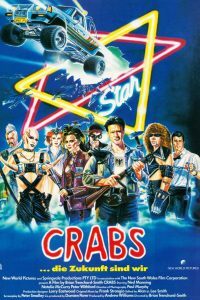 I could say the “star” but anyone playing a character called “Crabs” would struggle to call themselves a star. Crabs was no Mad Max and nor was the film. 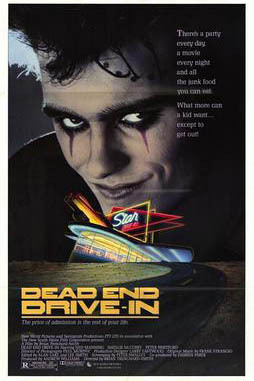 Dead End Drive-In is based on the Peter Carey short story Crabs. The producers had been through a number of directors before they settled on Brian Trenchard-Smith. Brian never read Carey’s story but I had, and so too had the designer, Larry Eastwood and the DOP, Paul Murphy. We all thought we were making a film based on Crabs while Brian was making an extended car chase movie with featuring the world’s longest live action car stunt. Right from the beginning it was clear that this was going to be an interesting ride. A temp at my agency, RGM, had rung one lunchtime while I was writing and asked me how old I was. The first week of the shoot was uneventful except the producer got sacked, the camera operator resigned and the hair and make-up department followed suit. If anyone else from the agency had taken the call from the casting agency I would never have been put up for it. They all knew I was 34. But the temp didn’t. When my agent rang back we decided I’d stick to 25. I mean, how many actors throughout history have fibbed about their age? By some miracle I got the job. My acting career so far had been rocky, to say the least, so I didn’t want to jinx myself by doing cartwheels. I’d already been booted from one job after a protracted casting process so I put the champagne on ice. Literally. I was playing two roles. One was Crabs, the other was 25 year old Ned Manning. The latter role threw up a few interesting challenges. Like when Brian drove me and fellow lead, the late Natalie McCurry to a screen test in his brand new sports car and a Herman’s Hermits song came on the radio. Brian wound up the volume. The first week of the shoot was relatively uneventful except for the fact that the producer got sacked, the camera operator resigned and the whole hair and make-up department followed suit. Not surprisingly I was a little nervous someone would find out how old I really was I would be the next to go. I confided in Natalie and told her that my first child, Jack, had just been born and that I was married. She was totally cool about it. Natalie was a beautiful human being and we got on like a house on fire. Dead End Drive-In was shot almost entirely at night at the old Matraville Drive-In. It was a gruelling shoot with clouds of thick black smoke from the tyres that were constantly burnt to create atmosphere but made breathing difficult. Brian and I got on pretty well. He wasn’t too interested in me and let me go about “acting” without too much in the way of actual direction. He was in a world of his own and so, ironically, was I.
Thankfully I had the late, great Peter Whitford to bounce ideas off and re-write scenes with when Brian wasn’t about. We pretty much wrote the dialogue for all our scenes together. Not only that, but when Brian was off checking out the extras costumes I got to direct a scene. If you could call saying “action” and “cut” directing. I was in constant discussions with the art department and Larry and Paul about trying to remain faithful to Carey’s story. They certainly achieved that. The look of the film is one of the reasons it has become a cult classic. I did have one moment with Brian when I was crawling along under a row of cars as the bad cops pursued me and I looked up to see Turkey Shoot being screened at the drive in. I suggested to Brian that it might be a bit much screening one of his old films while we were shooting a new one. He shrugged it off. He was probably right. It added to the overall weirdness of the film. I had an enormous amount of freedom which meant that I could make choices like making Crabs an ally of the Asians in the drive in who were being victimised by the racist hoons who attacked him. It might be one of the reasons why the film has some relevance today. 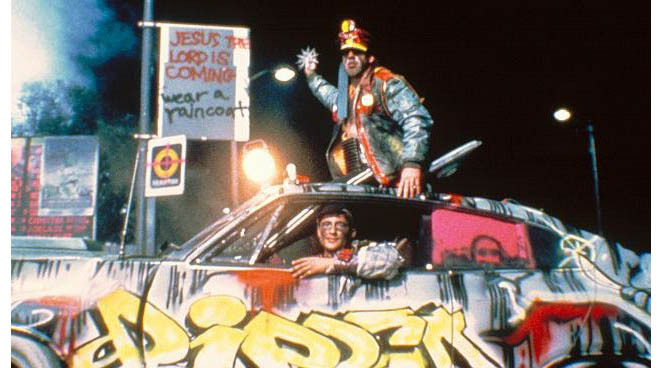 If the film itself was bizarre what happened after we finished shooting was even more so. Before it was screened here it was taken to Cannes but neither Nat or I were invited. Brian went with the NSW Film Corporation heavies. Nat ended up paying her own way but I stayed home to spend time with the little boy I’d been away from during the six week shoot. I was woken early one morning by my aunt who heard on the ABC that Dead End Drive-In had achieved a huge sale at Cannes and was going to get an 1800 screen release in the US. A friend sent me a picture of a huge billboard of me on the beach at Cannes. It was pretty strange. I was contacted by my agent, Robyn Gardiner, who told me that they had tested the film in the States and the audiences hadn’t understood our accents. They wanted to dub it with American accents. They had done it with Mad Max 1 so they didn’t see it as a problem. But I did. This was a time when we were fighting for an Australian voice on our screens. The idea that we would have characters in a film set in Aussie suburbia talking in American accents seemed ludicrous to me. I thought we were over the cultural cringe. Anne Britton from Actor’s Equity talked to me and we agreed that this was a matter of principle. 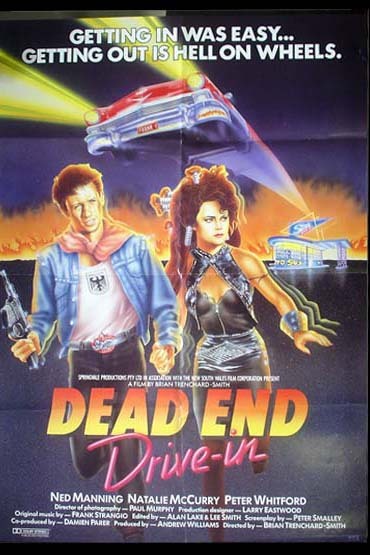 I spoke to Peter Whitford and a few of the other actors and we all agreed that Dead End Drive-In should be screened with Australians speaking like Australians. It wasn’t like there were any Shakespearean soliloquies in it that the Americans wouldn’t be able to understand. No one from the Film Corp spoke to me and nor did Brian. They told Robyn that if I didn’t agree to the dubbing the film wouldn’t get its big release. And that was that. It was given an art house release in the States and surprisingly received good reviews. Especially in the Hollywood Reporter. Quentin Tarantino said Dead End Drive-In was his favourite Australian film which I thought said more about him than the film. I heard about its Australian release while I was filming Pals, a kids’ mini -series, in Adelaide. The big release planned at drive-ins around the country with the Hunters and Collectors brilliant soundtrack being played live was canned. It came and went in a week without anyone knowing it was on. It was screened to pretty universal condemnation at the AFI awards but a few of us got together and with the help of Dendy Cinemas arranged a few screenings around the country so that anyone who wanted to see it could. Again most of the reviews were surprisingly good. It was released on video and that, I assumed, would finally be that. But a young man working in a video saw it and fell in love with it. His name was Quentin Tarantino. He was to say it was his favourite Australian film which, I thought at the time, said more about him than the film. From that day to this Dead End Drive-In has refused to die. It keeps popping up in the strangest circumstances. It was featured in the Not Quite Hollywood: The Wild Untold Story of Ozploitation doco although a planned interview with Nat and I never eventuated. Periodically I get phone calls out of the blue from the States and the UK asking me about the film and telling me about its cult status. Apparently it was recently released on Blue Ray and people have dress up parties like they do for Rocky Horror. I’m not sure anyone dresses like Crabs, but they do like the other characters and that, in itself, is a testament to the work of those who were determined to bring the extraordinary Peter Carey story to life. It almost accidentally resonates with stories of detention centres and racism in contemporary Australia. Maybe that’s why it doesn’t seem to die. Or maybe it’s the final scene when Crabs almost turns into a car (as he did in the story) in the longest live stunt leap in film history. Who knows?